Though mostly deployed overhead throughout the store, a few low uses allowed a detailed look at these Ball-Stopped Slatwall Faceouts for T-Shirts. A heavy-duty Backplaye and Tubular Arm would support significant load, even though only lightly stocked here. The Ball-Stopped Arm insured merchandise stays where you put it … on the Faceout. 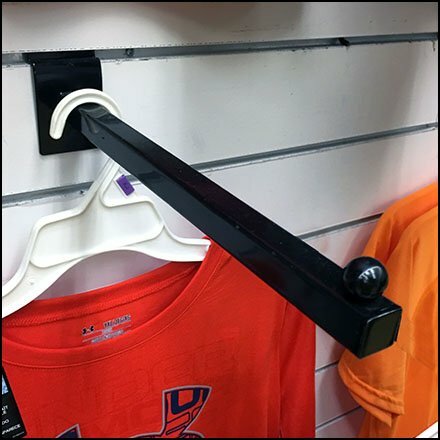 These Ball-Stopped Slatwall Faceouts for T-Shirts seen at Schuylkill Valley Sports, Wyoming Valley Mall, Wilkes-Barre PA.